“You are my sweetest downfall. I loved you first, I loved you first. If the devil came to me one night and asked me what I wanted in exchange for my soul, I would say chocolate. Well, next to eternal burgers. Burgere et scelerisque pro infinita. The devil speaks Latin. Chocolate is one other thing I can never say no to. Being the only islander who has never been to this proverbial chamber of dark delights, I made my way to that little lane beside Sarrosa with the PussyKat in tow to find The Chocolate Chamber. We found ourselves outside a small, glassed-in, one-floor affair. A few tables were set outside the glass windows, horsetails swaying in the gentle breeze. Floppy hats and straw fedoras were made available for patrons unable to secure seats inside air-conditioned comfort. We were in luck that the Sunday crowd hasn’t come in from after lunch yet. Walking in, we were welcomed with a beaming smile from a familiar face who later turned out to be Edu Pantino, a veteran from my old Queen City Toastmasters Club, now TCC’s Managing partner. Small world. Even tinier island. Looks like we’ll be in very good hands this afternoon. The dark wooden door opened into a classic tearoom, tables covered in white, monogrammed tablecloths; a bar stocked with a dizzying array of products, the back wall lined with gleaming tins. One can’t help but feel his nose slightly upturned by the setting alone. Dainty, gold-rimmed plates were set with monogrammed napkins and water served in cracked-finish shot glasses. 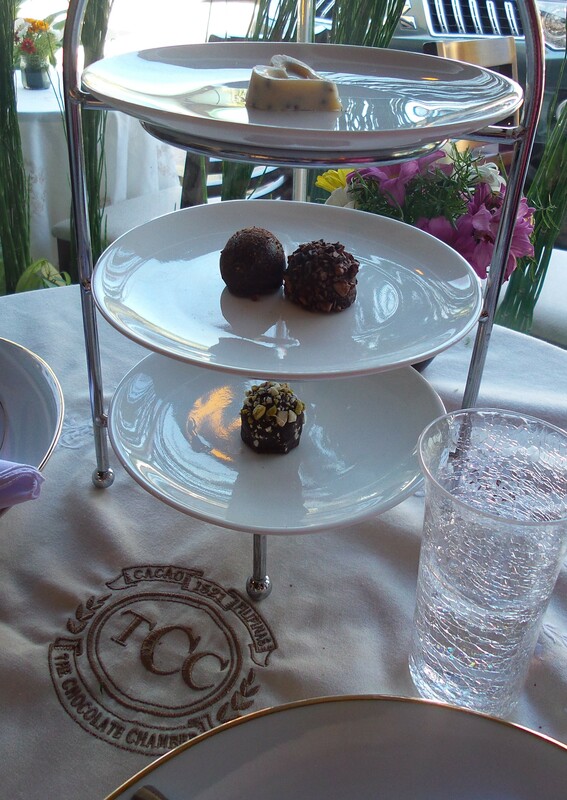 A three-tier server of complimentary chocolate truffles were served shortly thereafter: Chocolate Ganache, Chocolate-Caramel and Pistachio-crusted Marzipan. On the top tier rested their Valentine special, a white chocolate heart with cocoa nibs. The truffles held amazingly in room temperature. Their thin shells making a satisfying crunch before giving into their soft centers. They were as I like my chocolate, dark. 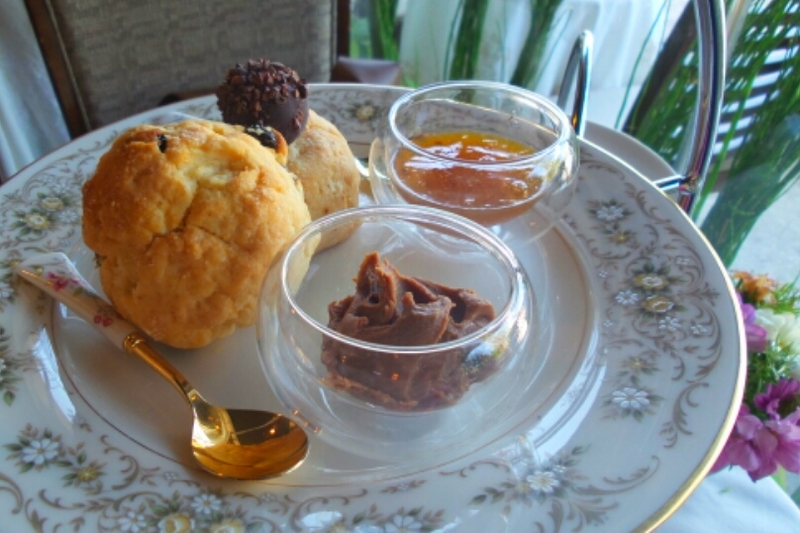 The High Tea set came in a larger three-tier: Raisin and Plain Scones with Chocolate Peanut Butter and Mango Marmalade, Turkey and Beef Pastrami Pan de Sal Sandwiches; Green Salad with Cocoa Nibs, Cashews and fragrant Cocoa Butter Vinaigrette. The scones were a bit too biscuit-crumbly for my taste and the chocolate of the Chocolate Peanut Butter got a little lost in the Choc-nuttty paste. The Mango Marmalade was wonderful in how it was proudly homemade but does not do much to distinguish itself from a jar of Lady’s Choice. The Turkey and Beef Pastrami Pan de Sal Sandwiches were easily the stars of the set, each in the trio stuffed quite generously with filling and making a serious apology for the scones. I’d come back for these. 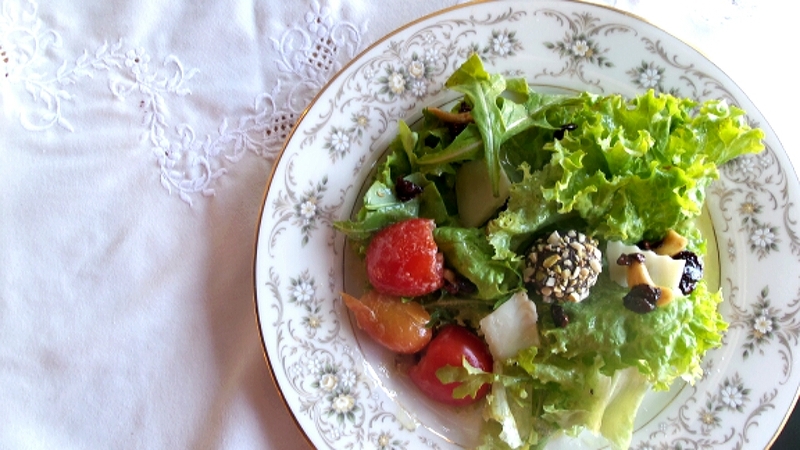 The Cocoa Butter Vinaigrette lit up an otherwise regular salad of lettuce and tomatoes. The Cocoa Nibs added a beautiful, bitter crunch along with the nutty taste of the cashews. The cheese, which I wasn’t able to identify, was mild enough not to provide a distraction. Note to self: brush up on cheeses. 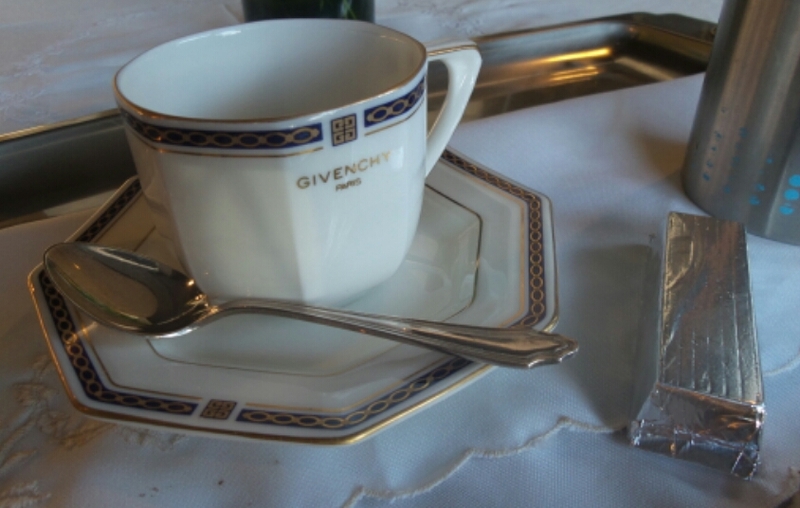 The Venetian Hot Chocolate was served on a lined, silver tray. A strawberry-shaped chocolate sitting in the Givenchy cup. The luxe label raised an eyebrow and Edu declared rather cheekily that they “use good china.” A bar of foil-wrapped chocolate was dropped into a thermal of steamed milk and shaken to mix. This bar-type preparation took some points off. Too Bond. A slow swirl into a candle-heated cup would have befitted the entire arrangement. The cream-inclined would enjoy this rather milky hot chocolate. I prefer mine very dark and heavy. The Hibiscus Hot Chocolate was a heady love potion with the hibiscus coming across more by the stimulus of fragrance than by actual taste. A close comparison would be Gelato Eliseo’s Rose Petal Gelato but with a clear, chocolate finish to the more exotic Hibiscus flavor. One of their friendly waitpersons helpfully informed us that the Hibiscus essence is the only imported ingredient in their lineup. I would certainly love to see an expansion of the floral-flavored selection. Clearly not for the mass market, The Chocolate Chamber is sadly located across a junk shop operation. While that was clearly an eyesore it is also a good juxtaposition for one other thing its patrons buy aside from the chocolate. . . The Chocolate Chamber is located at Quirino corner Magsaysay St., Mabolo, Cebu City, Philippines. 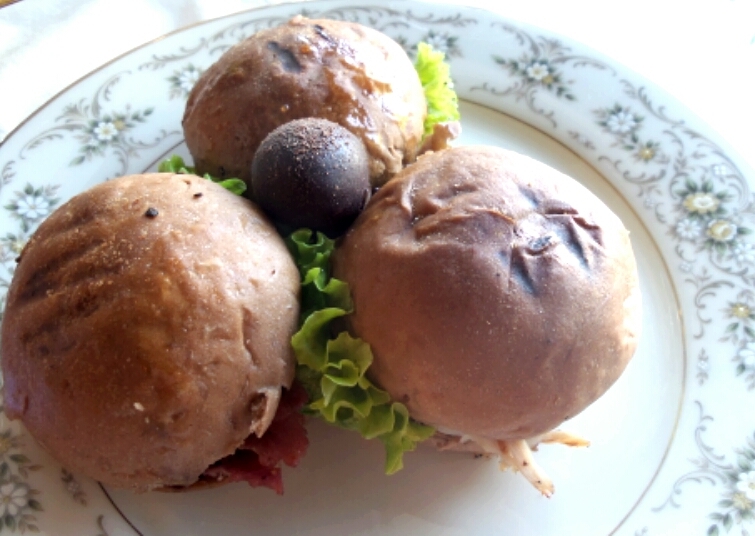 This entry was posted in Uncategorized and tagged Café, cebu, chocolate, Chocolate Peanut Butter, Chocolate Truffles, Cocoa Butter, Food, foodporn cebu, High Tea, Scones, Turkey and Beef Pastrami. Bookmark the permalink. Gatas Na Choco O Choco Na Gatas? Na Spongebob?